Help us raise $10,000 to send UCI Team Indonesia to Mojokerto, Indonesia to provide life-saving techniques and equipment to the surrounding communities! 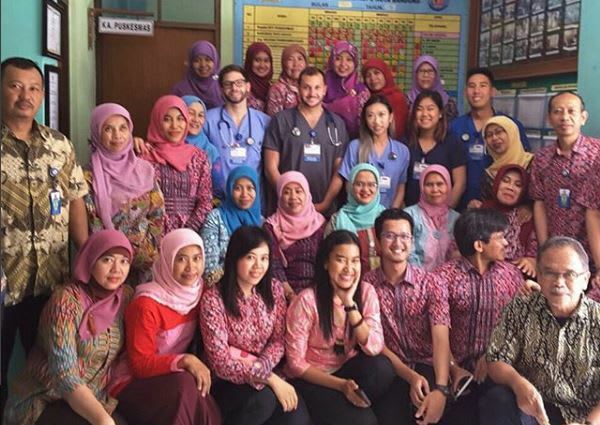 THE TEAM: We are 10 first-year medical students from UCI School of Medicine who will be partnering with a health sciences college, Sekolah Tinggi Llmu Kesehatan (STIKES), in Mojokerto, Indonesia to teach Indonesian medical and nursing students and midwives how to perform critical ultrasound techniques. Our obstetrics ultrasound lessons may be vital to saving expectant mothers with high-risk pregnancies. By teaching relevant scans such as the FASH scan, an efficient and low-cost ultrasound technique to diagnosing Tuberculosis and HIV co-infections, we hope to teach local providers the skills to save lives and prevent the spread of infection. Our mission to offer students and midwives a free education in ultrasound, and it would be impossible without your support. Indonesia has one of the highest incidences of smoking in the world, with 72% of the male population over 15 years of age using tobacco products. According to the CDC, smoking is the leading cause of death in Indonesia. We are comparing two methods of surveying smoking usage in patients that present to the clinics and hospital. We hope to demonstrate that computerized screening may be optimal for acquiring sensitive information from patients, such as the number of cigarettes they smoke per day, which can reveal an increased number of patients that would benefit from earlier interventional counseling. We will use point-of-care ultrasound (POCUS) to determine a baseline range of aortic valve hemodynamic measurements, such as carotid artery velocity and presence of plaques, that are critical for diagnosing and grading the severity of aortic stenosis in a sample of the Indonesian population. We will then evaluate the relationship between tobacco smoke exposure and these ultrasound cardiac measurements. We will use POCUS to characterize the diameter of the portal vein and investigate its relationship with tobacco smoke exposure in the Indonesian population. Portal vein diameter can be used in the diagnosis of portal hypertension and we would like to establish a baseline mean diameter in the Indonesian population. We will assess the short-term efficacy of a 2-week ultrasound curriculum: “Ultrasound Basics” taught to medical students in Indonesia. The secondary objective is the long-term efficacy of the “Ultrasound Basics” course based on knowledge retention, which will involve the medical students who took the course the previous year in June 2017. WHY FUNDRAISE? The ultrasound curriculum will be educating 40+ medical and nursing students and midwives over the course of two weeks on ultrasound techniques. Additionally, the team will be gathering data and conducting research to add to the currently limited health data for the Indonesian population. We need your assistance to afford the costs of hosting this free curriculum as well as research expenses associated with our projects. And beyond the costs of running the program, we hope to purchase and donate a new ultrasound machine so that the newly trained physicians can use their ultrasound skills to help the many patients who cannot afford or access expensive diagnostic tools, such as X-rays and CT scans. MORE INFO: We will continue to update our website, Facebook, and Instagram with blog posts, photos, and details of our numerous projects, so please stay connected. Thank you, or 'terima kasih banyak,' for your support! Your gift is tax-deductible to the full extent of the law. Please consult your tax advisor for more information. 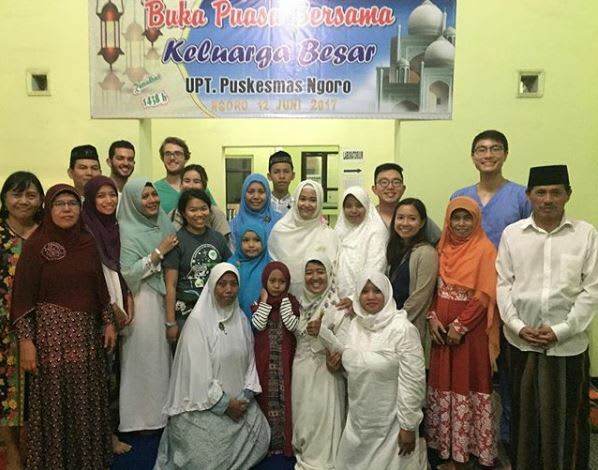 TIM: Kami adalah mahasiswa kedokteran 1 tahun dari UCI School of Medicine yang akan bermitra dengan perguruan tinggi ilmu kesehatan, Sekolah Tinggi Llmu Kesehatan (STIKES), di Mojokerto, Indonesia untuk mengajar dokter dan bidan Indonesia bagaimana melakukan teknik ultrasound kritis. Pelajaran ultrasonografi kebidanan kita mungkin penting untuk menyelamatkan ibu hamil dengan kehamilan berisiko tinggi. Dengan mengajarkan pemindaian yang relevan seperti pemindaian FASH, teknik ultrasound hemat biaya rendah untuk mendiagnosis infeksi HIV Tuberkulosis dan HIV, kami berharap dapat mengajarkan para penyedia layanan lokal untuk menyelamatkan nyawa dan mencegah penyebaran infeksi. Misi kami untuk menawarkan kepada dokter dan bidan sebuah pendidikan gratis di ultrasound, dan tujuan kami untuk menyumbangkan ultrasound ke masyarakat akan menjadi tidak mungkin tanpa dukungan Anda. INFO LEBIH LANJUT: Kami akan terus memperbarui situs web, Facebook, dan Instagram dengan entri blog, foto, dan rincian dari banyak proyek kami, jadi tetaplah terhubung. Terima kasih, atau 'terima kasih banyak,' atas dukungan anda. Your donation will go towards materials to make phantom gels and print handouts for our ultrasound curriculum as well as sanitary supplies! All donations $25 and above will receive a personalized note from our team expressing our thanks as a token of our appreciation! Your donation will go towards providing translators during our teaching sessions and research clinic trips! Your donation will go towards transportation costs between our living arrangements to the hospital during our three weeks stay in Indonesia! Your donation will go towards funding the ultrasound machines that we will be renting in order to teach the ultrasound curriculum! 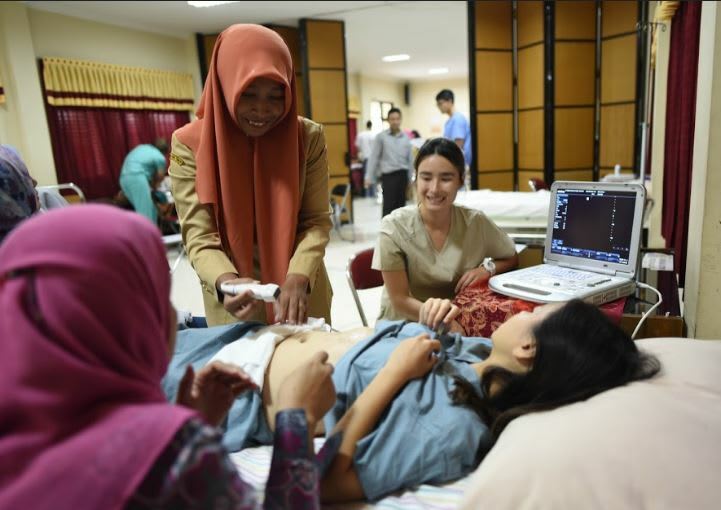 Your donation will go towards donating an ultrasound machine to STIKES in Indonesia for the physicians and midwives to use once they've completed their Ultrasound training, thus contributing to the sustainability of our project!